Hello, Awesome Readers! Today, I have a little treat for you: a guest post by the incredibly talented Elisa Lorello! For those who don't know, I'm a bit of an Elisa Lorello super-fan, having read all of her books, and was tickled (neon) pink to be invited to participate in Elisa's blog tour for her new novel (the third of the Andi/Dev/David series), She Has Your Eyes. The heartfelt sequel to Kindle bestsellers Faking It and Ordinary World will have readers in stitches and in tears, all over again. Andi and David have settled happily into Andi’s Northampton home, but David wants more. He wants them to get married. Their discussion is put on hold when Wylie, a fifteen-year-old girl, shows up in their backyard, bearing news that takes David’s mind off the future and sends it spiraling into the past. Reeling from David’s news, Andi receives a startling announcement of her own, one that leads to a relationship with her estranged mother. As Andi and her mother get closer and Wylie weaves her way into their lives, Andi finds solace in an old comfort: her ex-fiancé. With the past threatening to eclipse their future, the timing for a wedding is all wrong. But if Andi knows anything about timing, it’s that there’s no time to waste. Just look how cute she is in her DD shirt! Gah! I just love her so much! She Has Your Eyes is by no means autobiographical, but one scene really hit home with me, and it’s when Andi’s mother asks her to sing. 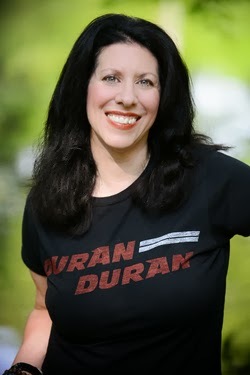 Some of you may know that I recently released Friends of Mine: Thirty Years in the Life of a Duran Duran Fan, a memoir about my longtime fandom of the eighties pop band, and the role growing up in a musical family played in it. Early on, I believed I didn’t have the talent my siblings had, and I’d desperately wished for it. It wasn’t until fairly recently, within the last five years or so, that I realized I may have been wrong about that—perhaps I didn’t have their talent, but I have musical ability. I spent 2013 working on both Friends of Mine and She Has Your Eyes, switching between projects, so maybe it’s no surprise that Andi found her voice too, so to speak. Andi’s singing wasn’t something I’d consciously set out to write about, but that’s what I love about writing fiction—the happy accidents, I call them—when I’m able to integrate something I’ve witnessed or experienced into a new context, and give it a new (and sometimes more poignant) meaning. Perhaps I’d never believed in myself as a musician, but my parents and siblings had never questioned it. That realization changed how I saw myself as a musician (or, at the very least, how I saw my musical ability). Perhaps I’d wanted to give Andi that same gift, and it would mean even more coming from the mother who had given Andi so little validation throughout her life. I’d included the first verse of lyrics to the Beatles song “Two of Us” in the original draft, but had to omit them because obtaining permission to print them in the novel would’ve cost too much money (something I’d learned while writing Friends of Mine). I wish we could have, though. It made the scene even more emotional (which is really saying something considering how much I tear up when I read the final version). I hope you’ll look them up, perhaps jot them down in the margins. So, is Andi a singer now? Will she pursue music like her two brothers did? Who knows? As for me, I was honored to perform with my siblings at a very special event for my mother in August 2013 (Duran Duran Appreciation Day, coincidentally. Yes, such a day exists. Couldn’t have been better scripted.) It was the first time all seven of us performed together in public. I even sang harmonies. I sang again three months later with three of my siblings at a similar event, again at the request of my mom. Life imitating art, or art imitating life? Perhaps neither. Regardless, it’s a sweet note to end on. Add She Has Your Eyes to your Goodreads shelf! Follow along with the She Has Your Eyes Tour via Fictionella! Connect with Elisa Lorello at elisalorello.com! And because Elisa is extra, mega, awesome, she's agreed to offer a giveaway for a copy of She Has Your Eyes! How amazing is that? (Hint: the answer is very!) The giveaway will be open for two weeks. Good luck! Thanks so much to Elisa for writing such a great post! I like to think that I'm somewhat musically inclined, if only in the shower, but she's the real deal, people! YAY FOR MUSIC! And remember to stop by on Friday to read my review! 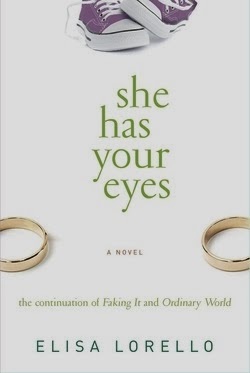 I pretty much had to skip the text of this post in case there are spoilers, but I'm 60% through with Ordinary World and cannot wait to get to She Has Your Eyes!